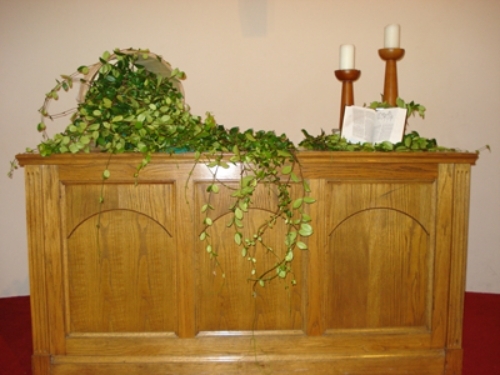 Each Sunday, the altar at Grace UCC is decorated to match the theme of the Sunday's worship to visually enhance our understanding of the scripture and lessons. 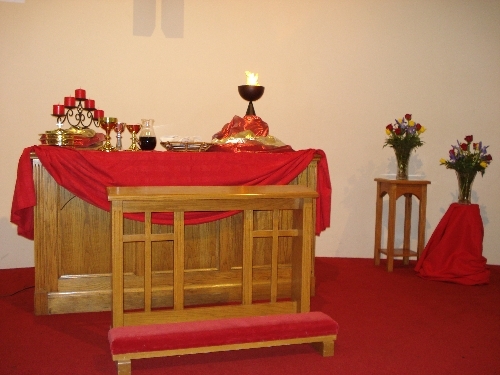 Sacrament (the communion cup) and Service (the towel of service): Jesus came for both and tells us " whoever wishes to become great among you must be your servant, and whoever wishes to be first among you must be slave of all. For the Son of Man came not to be served but to serve, and to give his life a ransom for many." 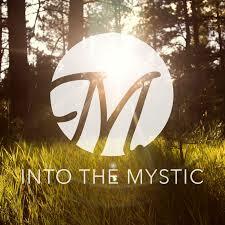 "What must I do to enter the kingdom of heaven?". Jesus said "Sell everything you have and follow me." 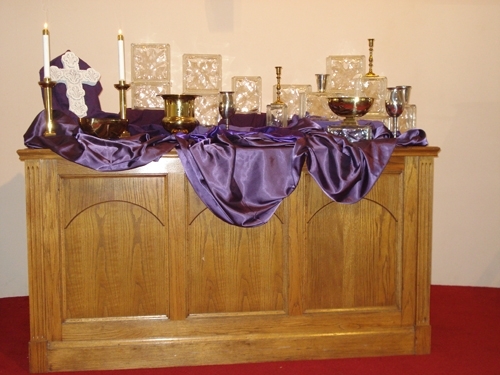 The altar reflects the "haves" and "have-nots" of the world; the rich and the poor; the abundance and the poverty. And the cross stands in the midst of all. 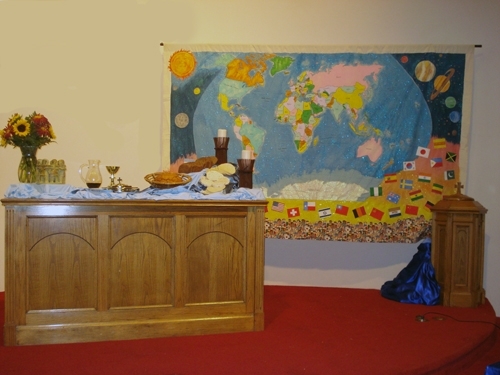 World Communion Sunday. A large backdrop of the earth framed the altar which had a wonderful sculpture of many people in a circle representing the Unity of Humankind. Jesus said "Who do people say that I am?" Who is Jesus? 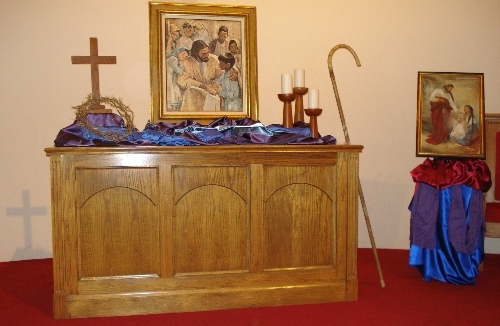 The altar reflects the many facets of Jesus: shepherd, healer, sacrificial lamb, one who welcomed children... and more. Abundance: We have more than enough in Christ. 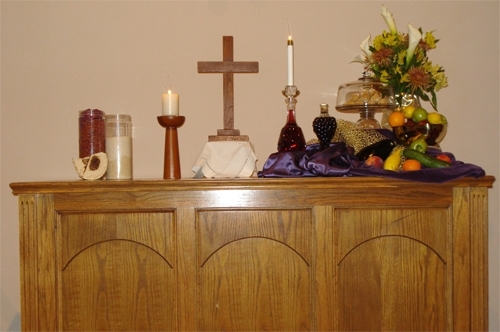 Bread of Life Sunday. 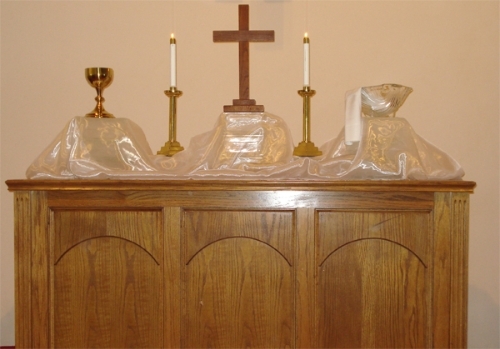 Jesus said "I am the Bread of Life."